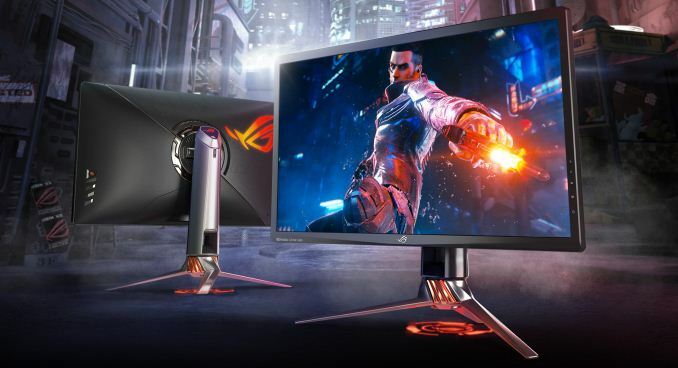 ASUS this week announced the final specs, official price, and launch timeframe for its highly-anticipated ROG Swift PG27UQ monitor that supports NVIDIA’s G-Sync HDR technology and features a 4K Ultra HD resolution as well as a 144 Hz maximum refresh rate. The display will hit the market in late June and will cost nearly $2000. As reported, both the ASUS ROG Swift PG27UQ and the Acer Predator X27 displays are use the same principle components as NVIDIA’s reference design for G-Sync HDR monitors and therefore offer very similar general specs (keep in mind that they are not the same monitors and the differences are noteworthy). Acer intends to ship its top-of-the-range Predator monitor on June 1 and Newegg is already taking pre-orders on the product. The ASUS display will ship a bit later, so it cannot be pre-ordered right now. As readers interested in the NVIDIA G-Sync HDR technology already know, the ROG Swift PG27UQ is based on AU Optronics’ 10-bit AHVA panel featuring a 3840×2160 resolution, a 1000:1 contrast ratio, 178°/178° horizontal/vertical viewing angles, a 4 ms response time, an "up to" 144 Hz refresh rate (native refresh rate is 120 Hz), and a 1000 nits peak luminance. One of the most important features of the monitor is its 384-zone FALD backlight to offer the necessary localized contrast ratios, which is enhanced with quantum dots to ensure the DCI-P3 color gamut. Meanwhile ASUS emphasizes that its PG27UQ monitor will ship calibrated to Delta E<3 accuracy and can display 99% of the AdobeRGB and 97% of the DCI-P3 color ranges. The display is VESA DisplayHDR 1000-certified and UltraHD Premium branding is pending. One of the interesting features that the ROG Swift PG27UQ supports is ambient light sensor that is used to adjust brightiness depending on ambient light conditions. When it comes to connectivity, the PG27UQ has a DisplayPort 1.4 input (which is required to display 4K content with a 144 Hz refresh rate and 4:2:2 chroma subsampling) as well as an HDMI 2.0 header (that can handle 4Kp60). In addition, the monitor has a dual-port USB 3.0 hub as well as a 3.5-mm audio jack. Since we are dealing with an ASUS ROG monitor, it supports various gaming specific display modes tailored for various genres. In addition, like all modern gaming LCDs, the PG27UQ comes with programmable LED RGB lighting. In particular, it supports the ASUS Aura Sync technology, two projectors (one projects lighting effects onto a desktop surface, another projects them onto a wall) and one LED zone on the back. 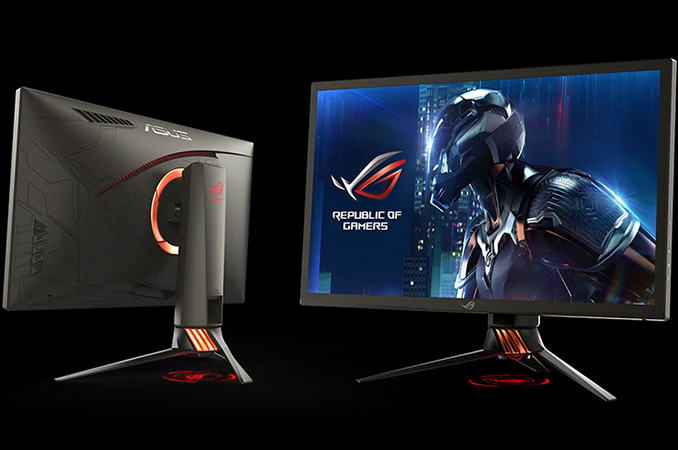 ASUS currently intends to ship its top-of-the-range gaming monitor in late June at an MSRP of $1999. Higher pixel density. Adaptive refresh rates. Lower latency. Maybe it's about time they start designing proper OLED screens for computers... For $2K I'm not looking forward to dealing with LCD blurriness/pixel response times. I own both a 200Hz VA and a 120Hz IPS screen which are really nice but still blurry to a certain degree. I don't even want to think what kind of artifacts and other funny halos we'll get with fast moving images and the FALD backlight.